Some days it is easier to pack lunchboxes for lunch even if you don't go anywhere. I love how easy it is to fill them when they are all lined up on my counter. That way I have a mini assembly line and can just put veggies and fruit in each one at the same time. Plus, the kids still love having lunch out of a lunchbox even if they are eating it at the dining room table. The lunchbox on the right is packed as I mentioned above and for my one child that does not like sandwiches I omitted the Turkey Club and just added Deli meat on food picks. He was happy with just the meat and you can add crackers to the lunch if desired. I even made lunchboxes for my husband and I. I have the same Turkey Club lunch as the kids and for my husband I made a Salad and Chicken Whole Wheat wrap. 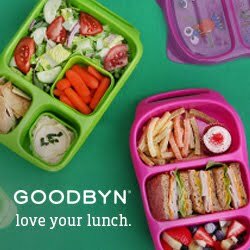 And if you need to make lunches for a big crowd...KeeleyMcGuireBlog has a great post about packing multiple lunches HERE. This is a fun idea to do at home. Your little one is just like my daughter who doesn't want bread with her deli.